I finished another UFO for the American Patchwork and Quilting 2016 UFO Challenge. It really surprises me what projects I have in my drawer. Most of them are not quilts to finish. Those I seem to get done. 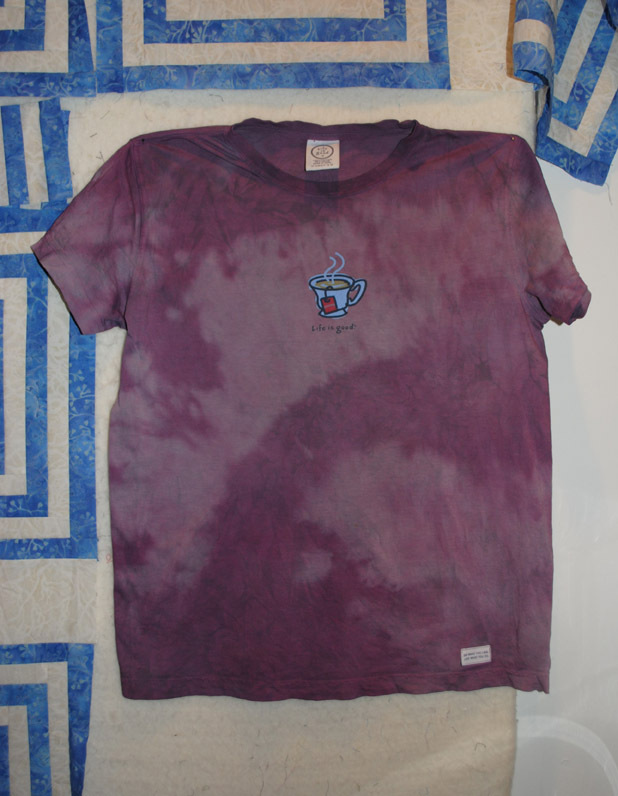 This month’s project was to dye a white tee shirt that had gotten stained. (I think from sitting in a wooden drawer too long.) While I was at it, I dyed something else that was white and also looking a little dingy. So, I re-watched Sue Bleiweiss on The Quilt Show as she explained her dyeing process and mixed up some purple dye in zip-top bags and threw my shirt in. And then, because I had a 4 year old sitting in the other room talking to me the whole time and I forgot to put in the soda ash, I mixed up another batch of dye and did it all over again the following week so I got lots of practice. You can still tell where the shirt was stained, but it looks a little better as light purple on dark rather than brown on white, don’t you think? And, after, oh probably 6 years unused in the drawer, I have a new shirt to wear!